With all the food restrictions that come with plans like the Atkins Diet or South Beach Diet, low-carbohydrate dieters often experience confusion about just what they can eat. Many foods are naturally low in carbohydrates. Use this list as a reference as you embark on your low-carbohydrate diet plan. Download the low carb food list. In compiling a list of low-carbohydrate foods, it is important to keep in mind that not all nutritionists recommend a strictly low-carbohydrate diet as a healthy way to lose weight. Check with your doctor for underlying health issues, and make sure you educate yourself about the basics of low-carbohydrate eating before undertaking a low-carbohydrate diet. Are Low-Carbohydrate Diets an Effective and Healthy Way to Lose Weight? 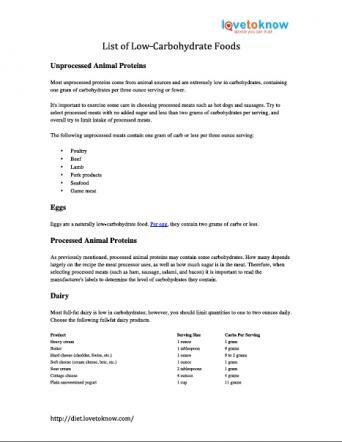 The printable of the low-carbohydrate food list can be helpful. If you need help downloading the printable, check out these helpful tips. Self Nutrition Data lists the carb counts of the low-carb foods listed below in their searchable database. Most unprocessed proteins come from animal sources and are extremely low in carbohydrates, containing one gram of carbohydrates per three ounce serving or fewer. It's important to exercise some care in choosing processed meats such as hot dogs and sausages. Try to select processed meats with no added sugar and less than two grams of carbohydrates per serving, and overall try to limit intake of processed meats. Eggs are a naturally low-carbohydrate food. Per egg, they contain two grams of carbs or less. As previously mentioned, processed animal proteins may contain some carbohydrates. How many depends largely on the recipe the meat processor uses, as well as how much sugar is in the meat. Therefore, when selecting processed meats (such as ham, sausage, salami, and bacon) it is important to read the manufacturer's labels to determine the level of carbohydrates they contain. Most full-fat dairy is low in carbohydrates; however, you should limit quantities to one to two ounces daily. Choose the following full-fat dairy products. You can eat most vegetables in relatively unlimited amounts on a low-carbohydrate diet plan. It's best to avoid or minimize starchier vegetables, such as carrots, turnips, beets, peas and corn. 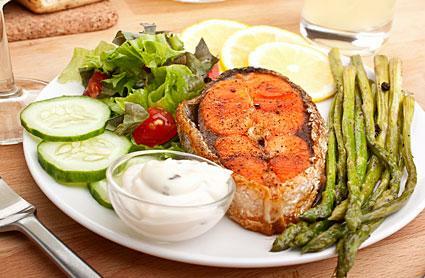 Other vegetables, like salad greens, spinach and green onions, also are very low in carbohydrates. You can eat a huge salad without worrying about consuming too many carbs. Limited amounts of fruit can be part of a healthy low-carb diet plan. However, some fruits are often restricted on low-carb eating plans because they are high in sugar, a form of simple carbohydrate. These include things like pineapple (4.8 carbs) and grapes (7.9 carbs). Other fruits are very high in carbohydrates, such as mangos (35.2 carbs) or dried fruit (63.6 carbs). Follow your plan carefully with respect to these items. Nuts and seeds are great snack foods for low-carb diet plans; however, quantity matters. Limit daily intake to one to two ounces unless indicated otherwise. All nuts should be either raw or dry roasted, and beware of honey-roasted products or those that contain other added sugar. If you use them in limited amounts, a number of jarred sauces can be part of a low-carbohydrate diet. Check for added sugar and avoid those that have sugar in any form. While these are general estimates, be sure to read labels for carb counts for specific brands. Limited amounts of alcoholic beverages can be part of a low-carbohydrate diet. It is important to note that the body processes alcohol differently than other nutrients, and this can cause blood sugar to be erratic. Beware of mixers, which often contain high levels of sugar and carbohydrates. Limit alcohol intake to occasional drinks, and limit quantities as suggested below. It is possible to eat a healthy, low-carbohydrate diet. By choosing a variety of proteins, vegetables and fruits from the list of low-carbohydrate foods above and working closely with your doctor, you may be able to experience better health through low-carbohydrate eating.